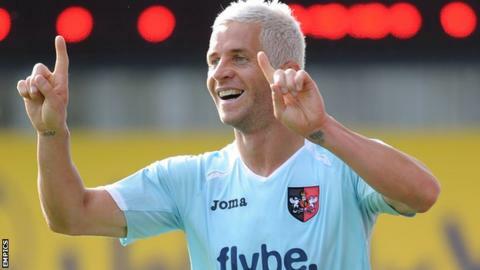 Exeter City striker John O'Flynn is hoping for a recall to face his former club Barnet. The 30-year-old Irishman has been on the bench for Exeter's last two matches, which both ended in defeat, after missing the win over Wycombe with a groin problem. "I'm definitely hoping for a start," O'Flynn, who has scored four goals this season, told BBC Radio Devon. "I'm fit again and raring to go if the manager makes the decision on Tuesday." O'Flynn, who was on target 34 times in two seasons at Barnet, has only hit the net when he has started a game. But in recent weeks he has lost his place to youngster Jimmy Keohane and a fit-again Alan Gow. "Jimmy came in and did well against Southend so there's people playing for places. "We're disappointed with the position we're in after the last couple of games. "But that just shows where we think we are and what sort of club we think we are," said Flynn. "We're still up there but there's still a lot of work to do in the season." "We've had a couple of disappointing results for us and it's about time we put that right," he added.